Sometimes you have an idea that you know is going to be just awesome and fantastic fun to make but is going to take time to bring to completion. Anyone got Cable! is an ambitious long term project that I'm ready to unveil as a sneak peak now. I started this in January and it's likely to take me the whole year to complete. So what is it? I call this a scarf-ghan. I was inspired by two free afghan patterns made modularly sewing up from long strips of knitting; Boy's Afghan by Ann V Gallentine and the Fisherman Sampler Afghan by Judy Gibson. 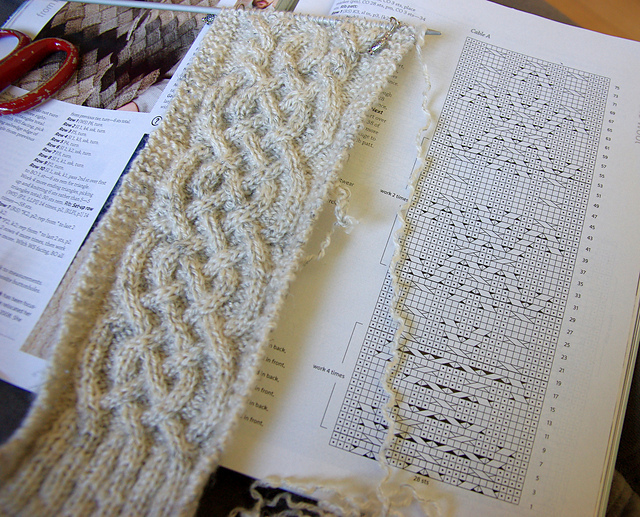 I'm constantly finding gorgeous scarf patterns that my knitting needles itch to make. But much as I hate to admit it, a girl can have too many scarves. 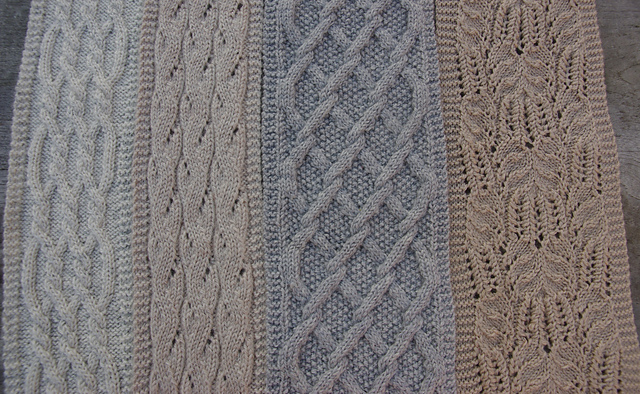 Why not knit all these gorgeous scarves, sew then up together and make a unique, one-of-a-kind lap blanket? A warm snuggly blankie is always useful. This project is also a designated stash buster. I've been collecting / acquiring (possibly you could call it hoarding) an array of recycled pure wool from our local op shop for a couple of years now. 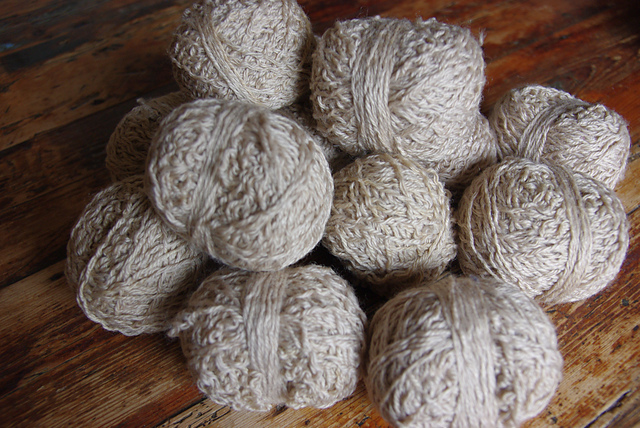 This particular op shop seems to have a unseen mob of little old ladies who recycle old knitted garments into gorgeous balls of crinkle cut yarn. I've been collecting all the neutrals, a beautiful array of cream, eggshell, fawn, tan, mushroom and greys from silver through pearly gray to smoke. This is a random sample of the selection of neutral coloured yarns I have. 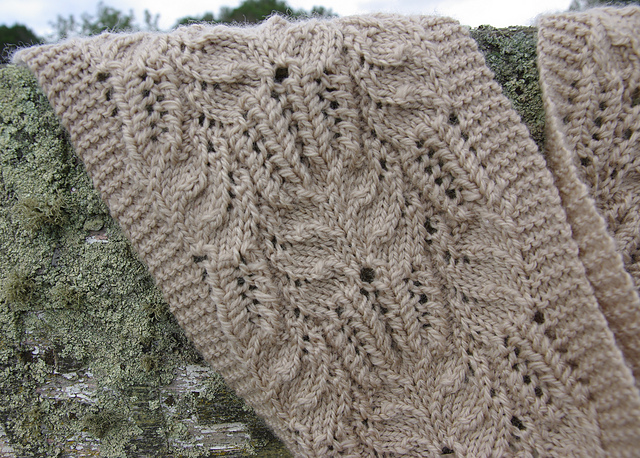 January saw me start with a gorgeous Celtic cable scarf with the most complicated cable chart I've ever attempted. 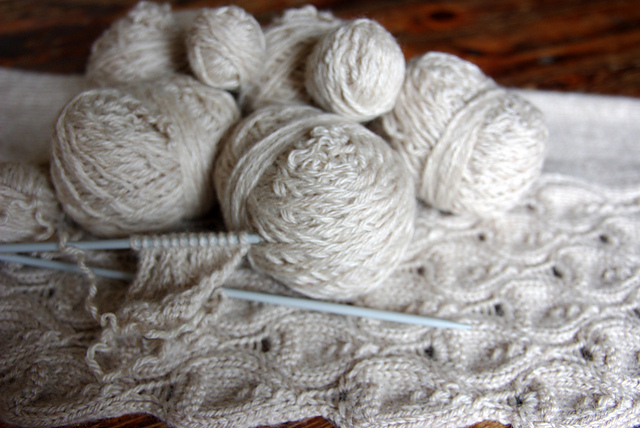 I also love this yarn. 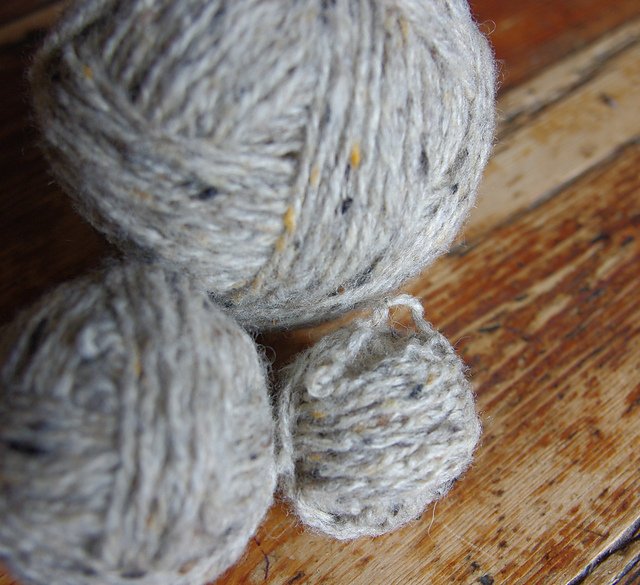 It's a gorgeous wool and mohair blend, a soft cream winter white with a smattering of small black fibres. 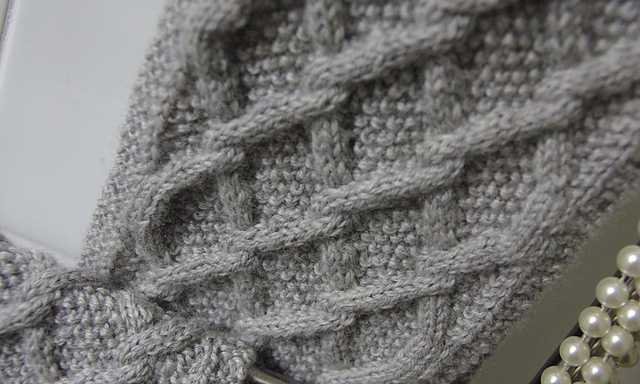 This was a slow but satisfying knit. 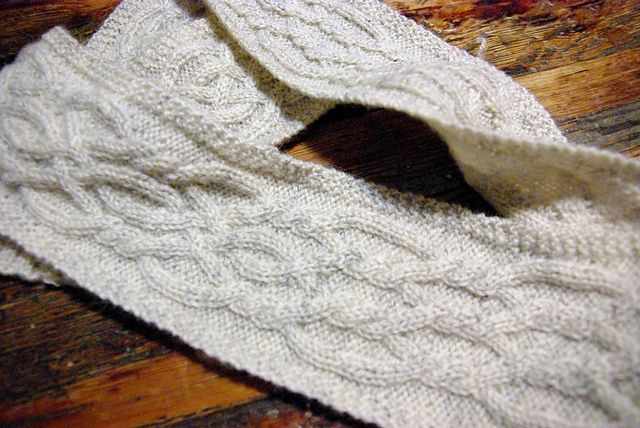 Pattern: Everstar Scarf from Josie Mercier from Interweave Knits Holiday Gifts 2013. 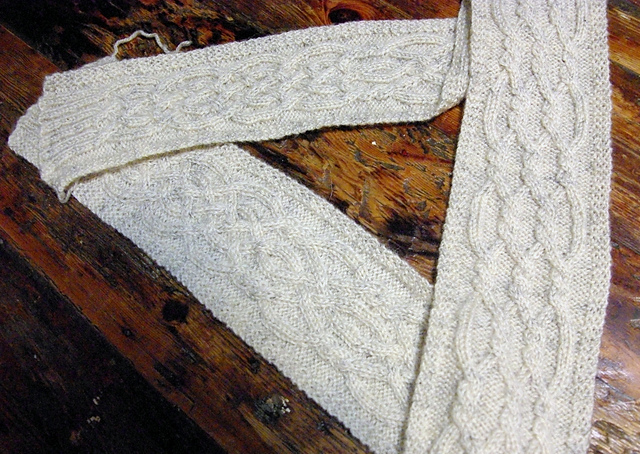 In February I changed tack and went for a lace patterned scarf. 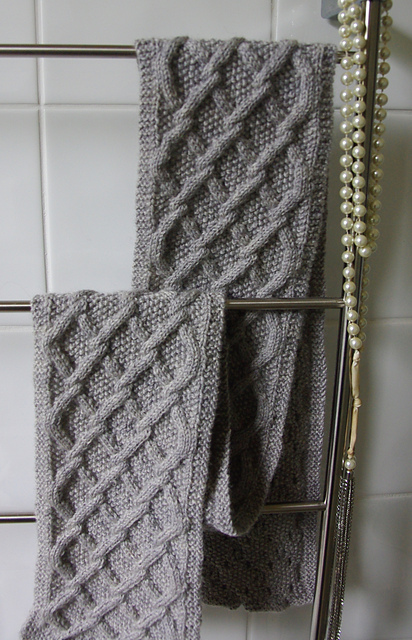 Pattern: Falling Water Scarf by Bonnie Sennott. 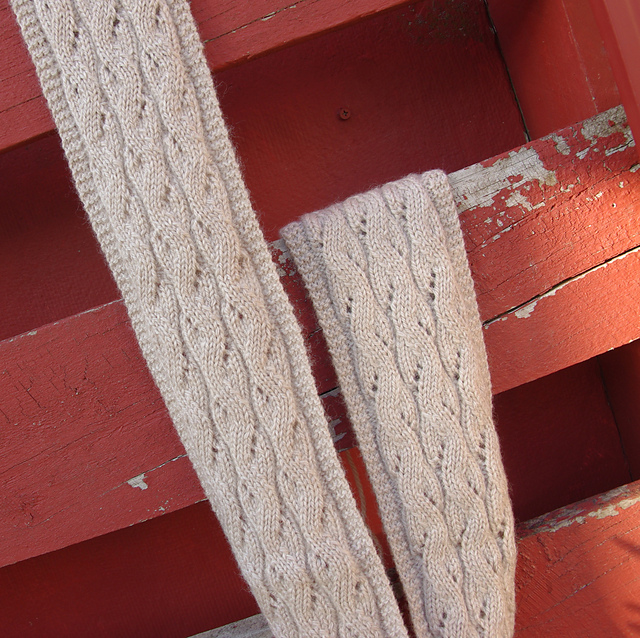 This is a beautiful mock cable and lace pattern and it's free. The second ball of yarn I used for this was having an exceptionally bad day. It was extremely dodgy with multiple knots. At one stage the back of the scarf almost looked like an Ood’s face with about 20 sets of ends in about 10 cm of knitting. I sewed in ends as I went though and as long as I was careful about hiding them by sewing them in vertically along the knit stitches in the back, it looks good. Cables again for March though I have to confess I started this in early February casting on and completing one repeat before putting it aside for most of the rest of the month. 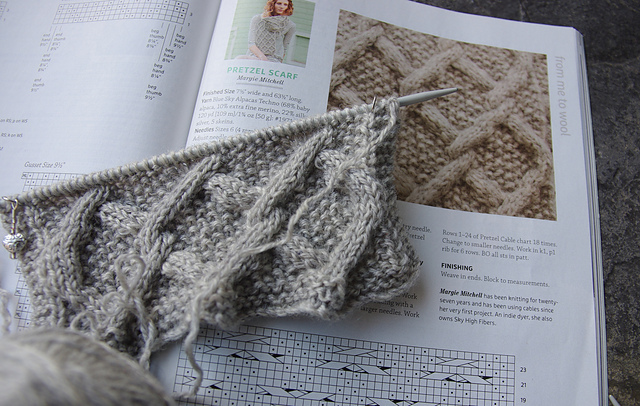 Pattern: Pretzel Scarf by Margie Mitchell from Interweave Holiday Gifts 2013. This one was not love at first sight I have to admit. It took me quite a while to warm up the beauty of this one and I wasn't fully sold on it till I was nearly finished. The pattern looks so much better in bulk so to speak. This one is officially the April strip but I cast it on and completed it in the last week or so of March. Lace again. 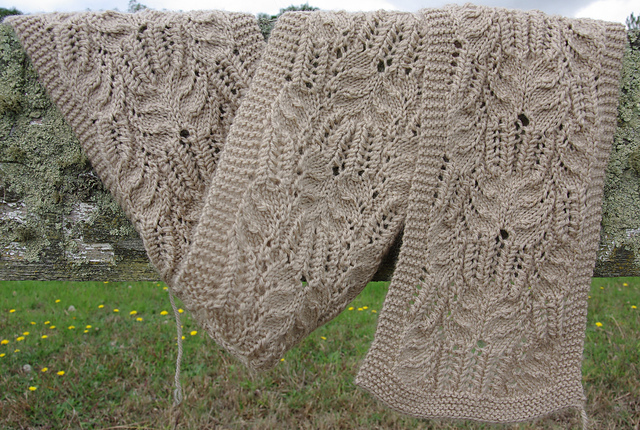 Pattern: Victorian Lace Scarf by Rachel Leverton. Again this is a free pattern. 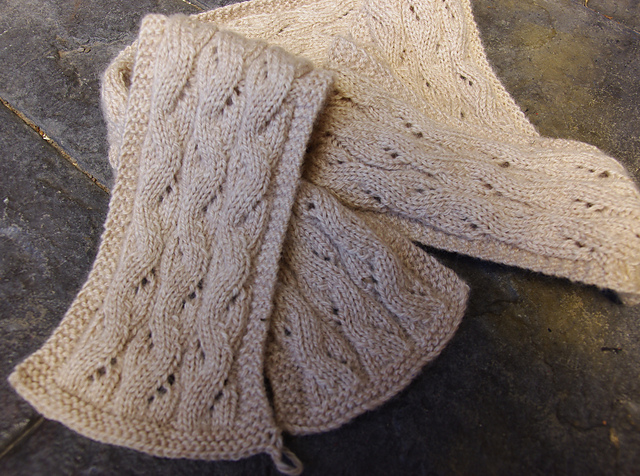 This is almost the same lace pattern as my Tribute Socks. (See Knitting Gymnastics: Tribute Socks). 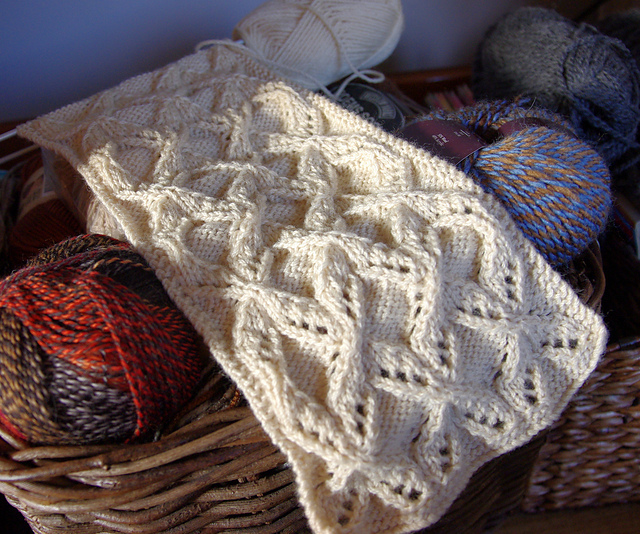 It was great fun to knit this lace pattern again on a larger scale. It almost flowed off the needles. 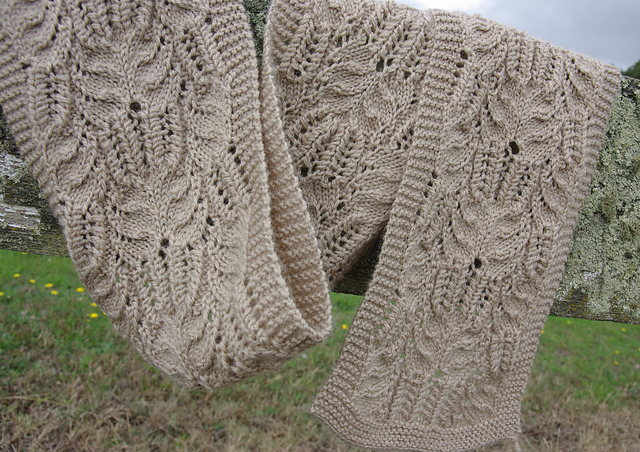 April's second strip is a combination of lace and cable and a free pattern: Twisted Ribbons Scarf and Cowl by Kristi Holaas. Here is its progress so far hanging out in the yarn basket in my lounge room. I'm really loving how all of these are looking together so far. This is going to be a very special rug. 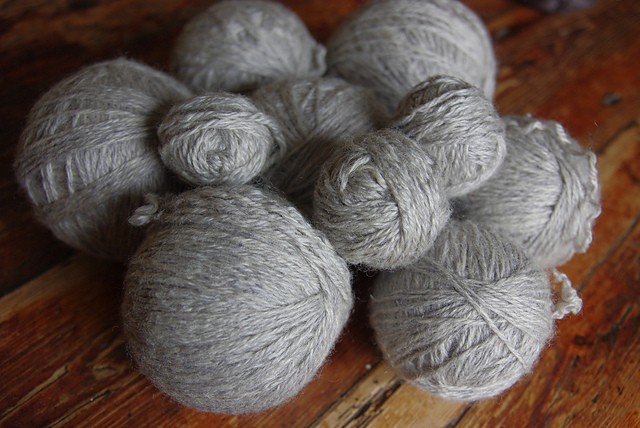 Have you seen the work on the Cheviots blog? She starts with cable patterns that interest her rather than scarf patterns, but it's a similar idea and very beautiful, I think. More power to both of you! 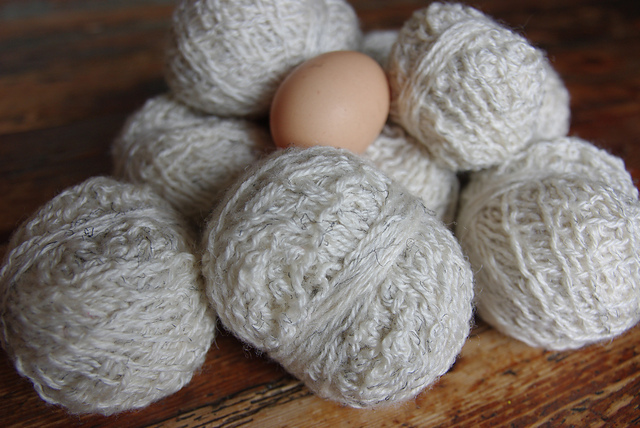 I hadn't seen Cheviot's blog before. Thanks for the link. I'll definitely be looking at more of this one. I love her cable rug too. I'm pleased you even think of what I'm doing in the same thought as awesome work like this. Oh and thanks for dropping by and commenting. It's great to know what other people think. You're very welcome. It is weird to put a post up and not know who is reading, isn't it? I rarely comment but was struck by the similarities. I'm glad you enjoyed it. She is a remarkable knitter, and I like reading about her train/walking/bicycle adventures, too.